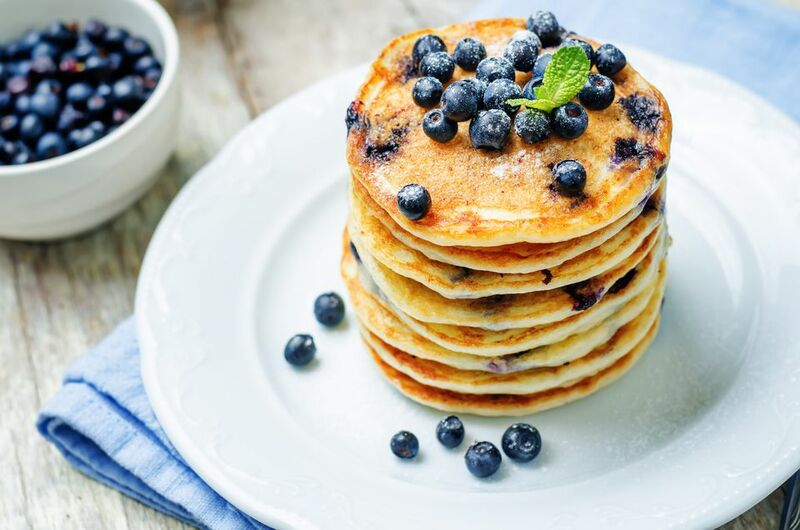 These great tasting blueberry ricotta pancakes are perfect for a special breakfast or brunch, and they're easy to prepare. Ricotta cheese gives them a wonderful texture and a small amount of orange juice gives them extra flavor. And add the orange zest if you are using fresh oranges. Serve these blueberry pancakes hot with pats of butter. Add orange wedges and the easy orange syrup, or serve the pancakes with your favorite syrup for a fabulous breakfast or brunch dish. Maple syrup or golden cane syrup are good choices. In a bowl, combine the flour with baking powder, soda, salt, and 1 1/2 tablespoons of sugar. In another bowl, whisk together the melted butter, ricotta cheese, egg, 1/2 cup of orange juice, milk, and 1/2 teaspoon of vanilla. Combine the wet and dry ingredients just until blended. Gently stir in the 3/4 cup of blueberries and 1 or 2 teaspoons of orange zest, if using. In a skillet or griddle, heat the vegetable oil over medium heat. Spoon a small amount of batter into the hot skillet and spread gently with the back of the spoon. If the batter is too thick, add more milk, a little at a time. When bubbles form and pop on the tops of the pancakes and the edge looks dry, flip them over. Cook until both sides are browned. Keep them warm in a preheated 200 F oven while you cook subsequent batches if you will be serving them all at once. In a saucepan over medium-high heat, combine the 2 cups of orange juice with 1/3 cup of granulated sugar, and 2 teaspoons of finely grated orange zest. Bring to a boil while stirring, until the sugar is dissolved. Reduce the heat to medium-low and boil gently until the mixture is reduced by half and is thick and syrupy. Stir in the 1 tablespoon of butter, 1/4 teaspoon of almond extract, and 1/4 teaspoon of vanilla extract. Add 3/4 cup of blueberries and then remove from the heat. Cool the syrup slightly before serving with the pancakes. Kids Love These Chocolate Chip Pancakes!